Due to numerous requests over the years sociologytwynham.com is pleased to announce the first of a series of sociology revision books. Whether you are revising for examinations or just seeking additional support, this range of books is a terrific companion to your studies. Packed with clear information a range of sociology revision books have been tailored by sociologytwynham.com to help you develop your knowledge and assess your understanding so you can achieve your full potential. 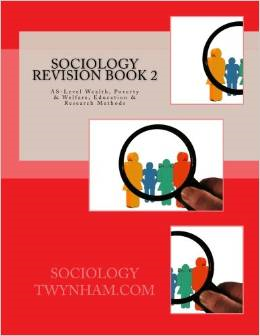 Suitable for all examination boards the first set of sociology revision books are available in paperback. Sociology Revision Book 1, AS – Level: The Family, Education & Research Methods complete with glossary and index. With 58 pages crammed full of vital knowledge your understanding of sociology is sure to grow. Sociology Revision Book, AS-Level: Test Yourself On: The Family, Education & Research Methods complete with over 130 questions and answers. With 72 pages of test yourself material you’ll be well prepared for any examination. Sociology Revision Book 1 combined with AS-Level Test Yourself On: The Family, Education & Research Methods complete with over 130 questions and answers. With its 128 pages, this two books in one option entitles you to free postage and packaging. Hi , i want to know that do u have any book which has questions and answers of the pastpapers ? Cuz im really looking forward to buy such a type of book . Yes thank you . Okay so the bulleton no. 1 is a revision guide for the family , education and research methods . All if these are included but not test your self qns . The second point is just the test your self for the above chapters . The third and fourth bulletons are individuals chapters test yourself and guides right . They are all for the same price right ? Moreover , if u can make something for paper 2 ,that would be great , i feel it is the hardest and really need help in that ! Hi again – I’ll answer each of your points so you’re 100% clear. Bullet point No1 is a pure revision guide for the Family, Education and Research Methods. Bullet point No2 is the Test Yourself question and answer booklet specific to, like you say, the Family, Education and Research Methods. Bullet points 3 & 4 are specific revision guides, these are ‘stand-alone’ specific to the Family and Education units. Each of these ‘stand-alone’ guides comes with its own Test Yourself section with around 30+ multiple choice questions (with 4 option answers to select from). One top of that there’s around 20 AS style questions with the accompanying range of answers to those questions. Thank u for your quick response and generous offers for help . The AS style Qns are essay style Qns ? Paper 2 – includes all the perspectives , research methods , sociallisation and the creation of identity and the relationshp between theory and methods . Hi – I will be writing content for the areas you mention but I doubt it’ll be ready for this year’s examinations. Regarding the AS question in the booklet, they are short answer essay questions. They’re designed so you can assess your knowledge and more importantly understanding by providing as many answers to the questions as you wish to form a succinct or medium sized essay. Again, I hope this helps. Any other questions, please feel free to ask. I have ordered the 2 &3 book . 🙂 hopefully will get it by 2nd of march . HelIo, I did not get my books . Amazon was not able to deliver my books and so it cancelled the order . I replaced the order more than 3 times but it failed every time . Though i have ordered books from amazon before as well and have recived them but this time it had failed after a 2 months long wait . So i guess i wont be able to review ur books and nor have the pricless resources with me . The amazon has given a new date again . Hope it gets here this time ! The author is C H Thompson, hope that helps.